As Barack Obama arrives in the Middle East this week, the sympathies of the American public remain firmly with Israel in its dispute with the Palestinians. And when it comes to Iran, the public continues to say it is more important to prevent Iran from developing nuclear weapons than to avoid a military conflict. The latest national survey by the Pew Research Center, conducted March 13-17 among 1,501 adults, finds that 49% say they sympathize more with Israel, while just 12% sympathize more with the Palestinians and the same percentage (12%) volunteers that they sympathize with neither side. Dating back to 1978, just prior to the peace agreement between Israel and Egypt, the public has consistently sympathized more with Israel than the Palestinians. But the partisan differences in sympathies are much wider today than they were 35 years ago. In the current survey, 66% of Republicans say they sympathize more with Israel than the Palestinians, compared with 49% of independents and 39% of Democrats. In the 1978 survey, conducted by the Chicago Council on Foreign Relations, 49% of Republicans, 45% of independents and 44% of Democrats sympathized more with Israel than the Palestinians. The survey finds that 21% of Americans say that Obama favors the Palestinians too much while 9% say he favors Israel too much; 41% say he is striking the right balance in the situation in the Middle East. The percentage saying Obama favors the Palestinians too much has changed little over the past four years. 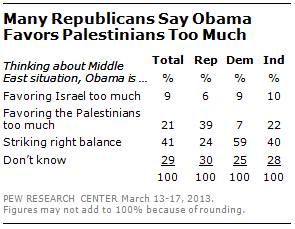 About four-in-ten Republicans (39%) say Obama favors the Palestinians too much. That compares with 22% of independents and just 7% of Democrats. prevent Iran from developing nuclear weapons, even if it means taking military action; 25% say it is more important to avoid a military conflict with Iran, even if it means they may develop nuclear weapons. 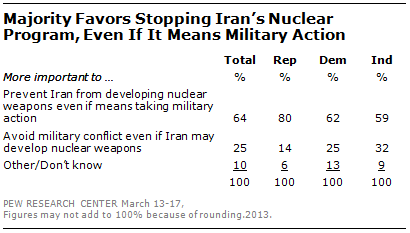 Majorities across nearly all demographic groups say it is more important to prevent Iran from developing nuclear weapons, even if it means taking military action. Still, Republicans (80%) are more likely to express this view than either Democrats (62%) or independents (59%). 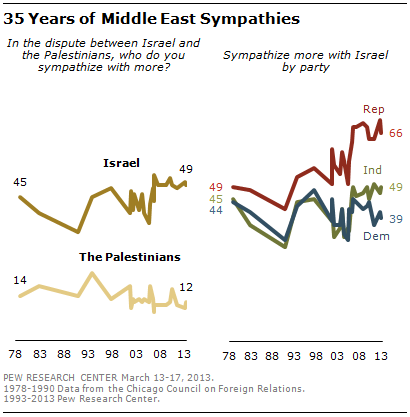 As in the past, there are sizable religious as well as partisan differences in Middle East sympathies. Fully 72% of white evangelical Protestants sympathize more with Israel, while just 8% say either that they sympathize more with the Palestinians (4%) or say they sympathize with neither Israel nor the Palestinians (4%). Most white Catholics (59%) also sympathize more with Israel. But just 37% of white mainline Protestants and 35% of the religiously unaffiliated sympathize more with Israel than the Palestinians. Two-thirds of Republicans (66%) sympathize more with Israel, compared with 49% of independents and 39% of Democrats. Age also is a factor in Middle East sympathies: Just 36% of those younger than 30 sympathize more with Israel, while 19% sympathize more with the Palestinians. A relatively large share of young people (37%) either offer no opinion (34%) or say they sympathize with both sides (3%). Among older age groups, there is more support for Israel: 47% of those 30 to 49 sympathize more with Israel than the Palestinians, as do majorities of those 50 to 64 (59%) and 65 and older (54%).